One interesting item of note, during our analysis of our opt-out rates for lecture capture we have noticed that the institutional average hides a much more complex picture. Although the average is 11.7% the minimum school level opt-out is as low as 0% and as high as 32%. Another trend seems to be STEM vs non-STEM subject areas. Both of our STEM faculties (Science & Engineering and Biology, Medicine & Health) have opt-out rates well below the institutional average. 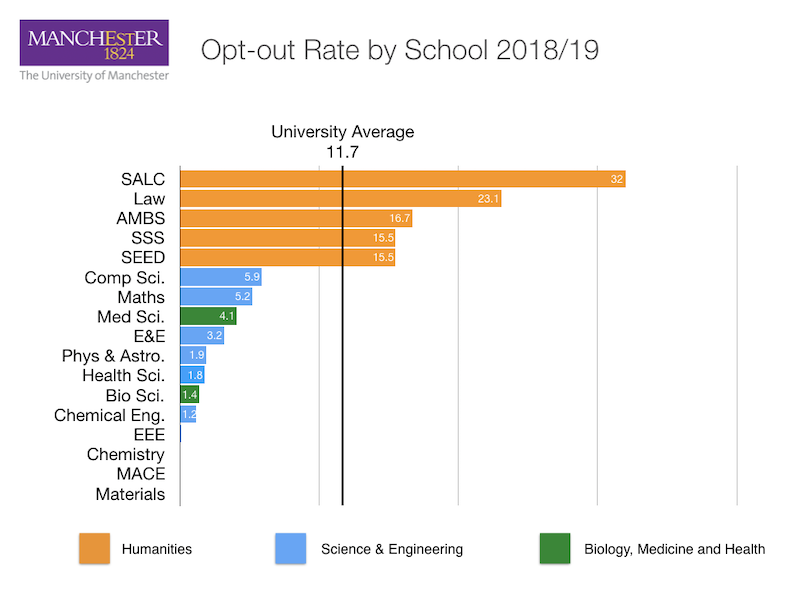 Within the STEM group the highest opt-out rate is almost half the institutional average. Conversely, all five Humanities schools have opt-out rates above the University average and in some cases, well above the University average. We do not currently gather the reason why an individual chooses to opt-out. It is likely we will attempt to survey staff who opt-out, however this may present some difficulties. Approximately 250 academics opt-out each year and anecdotally, a typical response rate to a voluntary survey will be between 10-15%. This would translate to 25 to 37 responses and this may not be enough data to obtain a clear picture. In the Suchter Rutherford Theatre there is a very long black board used by many teaching staff. 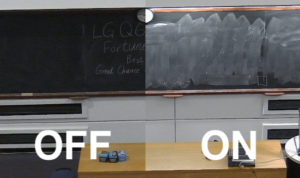 You can significantly improve the readability of the chalk board by using a set of lights as shown in this picture, however they are not easy to find. Hopefully this blog post will make that a bit easier! 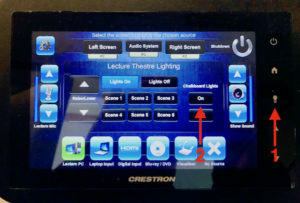 On the AV control panel there is a little light symbol as shown in the picture (marked 1). Pressing this reveals the lighting control setting for the room. On the right had side there in a button for the chalk board light (marked 2). Give it a try and you will really notice the difference. Apologies if you are a member of staff that has received multiple opt-out emails this week. There are several reasons that we send opt-out emails more than once, such as detecting significant changes in the timetabling of a course, however this week there was a specific cause that lead to more email traffic than normal. In order to select recordings to be made for students registered with The Disability Advisory Support Service (DASS), we connect to an application that helps us to calculate which courses DASS students are enrolled on, without the podcasting service knowing specifically who these students are. Recently some updates to this application changed a bunch of variables that made it appear as if a large number of DASS students had left the enrolment of many courses. Fortunately this has now been fixed, how ever we still need to notify staff by email if their courses are now flagged to be recorded for DASS students. This means one last round of sending emails and then you should here from the Podcasting Service only if there are significant changes to your course in future. 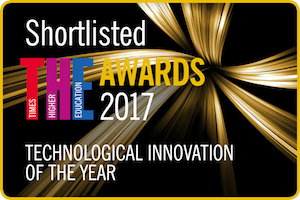 We’re very excited in the Media Technologies Team today as we have been shortlisted for THE Awards 2017, in the Technological Innovation of the Year category. THE Awards are known as the “Oscars of higher education” and our shortlisting reflects the University of Manchester’s recent work using lecture capture to support disabled students. We’ll look forward to the winners being announced on the 30th of November. In semester 1 of the 2017/18 academic year we will be testing a type of ‘on air’ light with our lecture capture system. The functionality has been developed by Paul Pettit at Keele University. The idea is to provide both staff and students with a clear form of feedback to show when a recording is in progress and an example of the light working can be seen here. The light will be rolled out to all CTS rooms in the Roscoe and Renold buildings and a feedback form will be circulated to teaching staff using those locations to assess its impact. The product we are using is a Blinkstick light and the code developed by Paul can be found on Github.